Use steam to clean the crud from your microwave! just add vinegar and water, then microwave for 7 minutes. The steam comes out of mama's head and softens microwave dirt and stains for easier cleaning! to use: first remove Angry mama's hair and head from body, then add vinegar and water to fill lines on the body. Add a squeeze of lemon Juice (or essence) to Liquid for a pleasant odor. Warning: do not overfill or boiling over might occur. Replace her head and hair parts then microwave for 7 minutes on high and allow to stand for 2 additional minutes. Remove Angry Mama from the microwave by her arms, which stay cooler. Use the remaining Liquid on sponge to clean microwave. Caution: hot Liquid! handle with care. Angry Mama is dishwasher safe for easy cleaning. 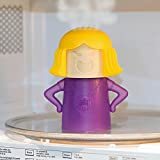 Interested in the Angry Mama Microwave Cleaner - Blue Base? Is the price too high? You can easily price watch this product and we'll notify you when the price reaches your target.